Rwanda is increasingly becoming attractive for Foreign Direct Investment. Dozens of businessmen from Turkey, one of the top investor countries in Rwanda, flew to Kigali to explore investment opportunities to tap into. On Tuesday morning, November 28, the Rwanda Development Board (RDB) hosted a delegation of 30 Turkish businessmen at the Turkish-Rwanda Business Forum at Serena Hotel. 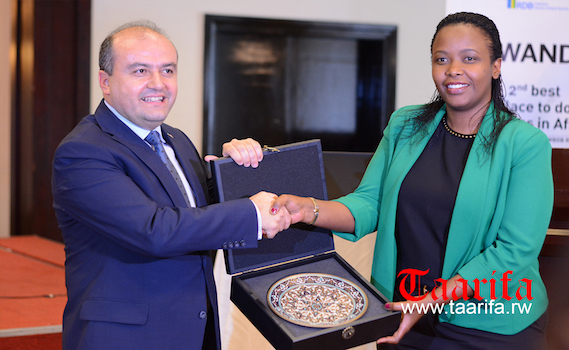 They had come to Rwanda to witness business opportunities presented to Turkish business people by RDB’s CEO, Clare Akamanzi during her visit in Turkey’s capital Istanbul two months ago. Volkan Kazova, a Turkish investor in energy, construction and hospitality businesses in Rwanda for more than six years, said that Rwanda ‘has a good name in Turkey due to its opportunities’. Kazova said that he believes that Turkish investors who engage in textile and meat processing businesses `will stay in Rwanda’. Clare Akamanzi highlighted some of the immediate areas of attraction. She said manufacturing is now a key priority; increasing products made in Rwanda, textiles and garments, which Turkey is among the best producers in the world. Food processing, tourism, construction materials, infrastructure, energy and mining among others, are other areas with untapped opportunities. The manufacturing sector is still small but steadily growing at annual rate of 7% and Rwanda targets to increase industrial contribution to GDP to 26% by 2020. Rwanda also needs to increase exports to US$1.5 billion by 2020 and increase the number of jobs to 1.5 million by 2024. Rwanda’s imports of new and second hand-second textile, apparel and leather products reached $124 million in 2015 compared to $50 million in 2010 highlighting the fast growing local demand. Construction materials currently account for 10% of Rwanda’s imports. At the moment, invested $15 billion (since 15 years ago) in Africa as it was $2 billion in the last 15 years and it is $17 billion today. Besides Rwanda being the second easiest place to do business in Africa, according to the World Bank, and the most competitive economy in African with an average GDP growth of 8% for the last seven years, creates a conducive environment for investors. According to the Global Competitiveness Report 2015, Rwanda is Africa’s most efficient government and the seventh most efficient, globally. Rwanda, is the 9th global most transparent country, first in Africa, and 9th safest place globally. It is the 1st in Africa and the 5th best country place to be in the world for women. In fiscal incentives for foreign investment, Rwanda requires zero corporate income tax for corporate planning to relocate headquarters in Rwanda, accelerated depreciation rate of 50% for the first year in key priority sectors; tourism and construction and exemption of capital gains tax for any registered investor with preferential corporate income tax rate of 15% for investment in energy, transport, affordable housing, ICT and financial services. Non fiscal incentives are quick business online registration (six hours), assistance with tax-related services and exemptions, access to access utilities and issuance of visas on arrival for foreigners visiting Rwanda, among others. Investment opportunities in Rwanda attract foreign investment more as Rwanda aims to be a middle-income economy in 2020, from agriculture driven economy to a service and industry based country. According to Akamanzi, Rwanda and Turkey business and trade relations have resulted in the creation of 1300 jobs for Rwandans and remarkably, the Kigali Convention Center has been constructed by a Turkish firm. By 2014, Turkish investments had reached $370 million, 12% of Rwanda’s total investments since 2009, and close to US$2billion invested today. The Deputy Minister of Economy of the Republic of Turkey, Fetih Metin has expressed the need of Turkey to maintain her political union with Rwanda, amplified by the similarities between the two countries, particularly good leadership by the leaders of both countries, President Kagame and Turkey’s Recep Tayyip Erdogan. He also mentioned that Rwanda has a young and dynamic manpower, expressing the fact that Turkey wants to make Rwanda its manufacturing center for the region due to its political stability.